Welcome to the FlightGear Newsletter! Please help us write the next edition! 1.2 SquawkGear: Bringing VATSIM to FlightGear! Welcome to the 12th (!) edition of the FlightGear Newsletter! Of course we will not ignore this mileage; you can expect a special jubilee edition next month. But first: June. I would like to use this moment to bring the rapid increase of (new) developers based at FlightGear's forum into attention. As can be easily seen in this newsletter, more and more users seem to make the small step (for mankind, but one giant leap for FlightGear :P ) to the developers-world. Some of these projects evolved over time from small solo-experiments to "major" projects with multiple people contributing. And that is exactly the whole purpose/advantage of being OpenSource. Let us hope this trend will continue in futher years and do our best to help more people in making that step. Enjoy this brand new edition full of news from your fellow pilots/developers! We would like to emphasize that the monthly newsletter can not live without the contributions of FlightGear users and developers. Everyone (with a wiki account, free to register) can edit the newsletter and every contribution is welcome. A build server like Hudson makes it very easy to automatically build FlightGear from source code, e.g. to check the integrity of the source tree or to help prepare prebuilt binaries, pre-releases or even releases. The server will need a proper home if it moves beyond the prototype stage. If anyone wishes to volunteer or help sponsor a proper server (with a reasonably symmetric connection) to run Hudson, please get in touch using the mailing list or the forums - any Unix will do, for Ubuntu/Debian there's an easy apt.get source available. All the setup can be done remotely, given SSH access. The disk, memory, CPU and bandwidth requirements are pretty moderate, due to our low commit rate. For additional details, please see FlightGear Build Server. SquawkGear: Bringing VATSIM to FlightGear! See SquawkGear for the main article about this subject. SquawkGear is the much-awaited client that allows FlightGear users to connect to the largest and most realistic sim server in the world: VATSIM. VATSIM is simply a network that can, in theory, take any sim, although the current ones are X-Plane and Microsoft Flight Simulator. Using addons like SquawkBox for MSFS, pilots must adhere to strict rules about realism. A valid flight plan must always be submitted before takeoff, for instance. And pilots must contact Air Traffic Control before any actions. SquawkGear brings this wonderful server to FlightGear. While installation is not as simple as that of VATSIM clients for MSFS, pilots are now able to connect to the VATSIM network and use chat and voice to communicate with other players and ATC. 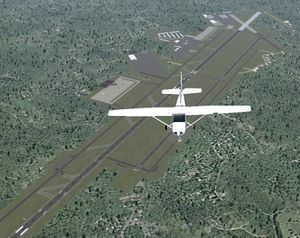 Since scenery is very different between sims, aircraft do not always appear where they are supposed to be; a MSFS user might see you hovering a few feet above the ground, for instance. With its first release, SquawkGear is an excellent addon for pilots wishing to get on VATSIM without having to buy the payware sims. It is strongly recommended that you read all manuals before connecting to VATSIM; not only because installation is tricky, but also because there are certain rules to be followed on VATSIM. You will find that your KSFO on VATSIM is a thousand times more under control than your KSFO on one of the mpservers! Special thanks to Ivan (Reed) for all of his work! Shootable/bombable moving AI tanks, jeeps, ships, and aircraft that catch fire, burn, explode, sink, crash, etc. nickyivyca is currently working on the Boeing 787. He corrected the FDM and changed some details in the model. More information at the forum. The C-130 Hercules is receiving some updates from glazmax and helijah. These updates include FDM and instruments fixes and improvements. Main gear wheel wells and covers. More information at the forum. MOJO is tuning the CH-47 Chinook. He spent some time adding external cosmetics which main purpose is to add more detail to the Chinook. He added antenna and aerials, domed windows, pitot tubes, winch, engine hub details and started with the internal cargo bay. He intends to be adding an animated refuel probe and will be including several liveries. His ultimate aim for the CH-47 Chinook is to attempt to get the model more defined and realistic. Zexe created a SF50 model. It is still at a very early stage. More information at the forum. "The CRJ-200 and 787 were made with very similar systems and such. Neither had a 2.0 compatible autopilot. So, I found out what was wrong with the one for the 787 first, and made those changes to the CRJ here. Both worked. I also did some FDM improvements, like moving the engines to where they really are and adding gear smoke and contrails." - says he in the forum thread. jackmermod is developing a P-40 model. It is already complete, and to be done are the animations and textures. Development of the P-40 Warhawk is coming along very quick, although a full release date is unknown. Yourgod has released a pre-alpha version of a Douglas DC-8-73 freighter. It is flyable and all major animations are working. The cockpit is incomplete. Info available on the Douglas DC-8-73 wiki page, the forum, or at his hangar. The Il-96-400/T has been updated to version 3, with more accurate model and a better panel, among other little fixes. vitos improved the MiG-15bis model, and released it. More information at the forum. The MB-339 PAN aircraft was updated by Albert to work with FlightGear version 2.0.0. The model is more "anatomically correct". Browsing through the files, HHS found a rotorcraft carrier model and made a scenario to run it, which will be available in July on Git together with the "Hermann Marwede", another scenario especially for helipilots. 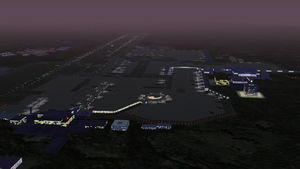 London Gatwick (EGKK) is being further improved and is in the second phase of development - night textures. All the buildings and features are currently being modified by karla to give suitable lighting and make London Gatwick even more attractive to FlightGear commercial fliers. Landing or taking off from Gatwick at night should add much to your enjoyment of the game - and most likely extend the hours you enter in your pilot's log. Further improvements and many minor changes are also being made to the existing models and daytime textures. The link shows an image of the part completed airport at night http://www.donlavelle.net/flightgear/flightgear19.html. The new scenery will be available through TerraSync and/or the Objects Database, but is already available at the forum. With the terrain updates that were discussed in the March edition still in our minds, we now have another feature for the area; taking it yet another step closer to a bussy and realistic representation of the real emirate! After looking jealously at the greatly enhanced airport Schiphol (EHAM) and the latest highlight Gatwick (EGKK) Mike (D-SKY1) decided to create interactive traffic for Dubai International Airport (OMDB). Based on the existing airport layout in FlightGear the traffic pattern for taxiing between gates and runways has been created in TaxiDraw next to a timetable for runway usage. Although no model work is done (yet) a big bunch of scheduled flights is now added to this important hub in the middle east. As Dubai is home port for Emirates Airlines (UAE) only Emirates flights are included. Within the next weeks more scheduled flights for AI traffic at Dubai will be added. During the process of creating AI traffic he tried to stay as close as possible to the real life timetable for Dubai International Airport querying several sources for double checking. As Emirates Airlines (UAE) is one of the most important customers for the Airbus A380 (UAE just ordered another 30 units of A380) the Emirates Airlines livery has been added to AI aircraft A380. Additionally some minor errors in several traffic files concerning changed ICAO codes for some airports have been removed. All changes are available via Git. Enjoy the enhancements; and always follow SIDs and STARs to prevent collisions. skyop released his improvements to the Meadows Field (KBFL) scenery. These include a new taxiway layout, more up-to-date runways, taxiway signs, various airport support buildings, some airport support equipment, some makeshift AI traffic, and placement of the international and domestic terminals. Read this topic for more information. Connecticut, Oshkosh (Wisconsin, USA) and the Toronto Harbor have been added to the FlightGear mapserver. They will be released to the public with the next scenery build, or alternatively the shapefiles can be downloaded and compiled by the user. This is in addition to the other numerous improvements to the land cover which are pending with the next scenery release, which includes (but is not limited to) France; Madrid, Spain; London, England; Bonn, Germany; Western Washington, USA; Northwest Oregon, USA; Phoenix, Arizona, USA; Washington, DC, and Baltimore, Maryland, USA; Rhode Island; Hawaii; and Long Island, New York, USA. After one year of having released these sceneries (LFLJ/EDDF), papillon81 returned to make changes (some of them big) at them. More information at the forum: EDDF, LFLJ. The B-25 served in almost every theater in World War II. From Europe to the Pacific, the Mitchell was there. One of the most famous missions accomplished by B-25s was the Doolittle Raid on Tokyo, when a group of 16 B-25s attacked the Japanese mainland, raising morale in the United States, and changing the priorities of the Imperial Japanese Navy, and possibly changing the direction of the war. The flightgear model looks good on the outside. 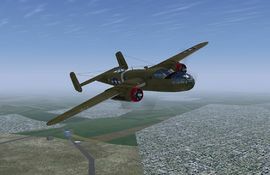 The author has done a lot of work on the textures, and this is improved even more by some excellent liveries made by Gooneybird that have been added to the B-25 base package by the author. The landing gear, engines and canopies are all carefully modeled, too. The Cockpit is a little bit threadbare, with no chairs, two pilot figures, and only the standard six instruments, which, admittedly, is more than enough to fly with. The only other issue I could come up with was the lack of weapons, but that is only an aesthetic problem. The B-25 handles nicely both on the ground and in the air. I can't talk about accuracy, however, as I have never flown in a B-25, so I don't know how it 'feels' in the air. The Mitchell sounds great, too! An exciting first contact was initiated between FlightGear team members and a hardware vendor resulting in an idea to operate a shared presentation of powerful hardware running a powerful flight simulator at the next year's LinuxTAG - to proof the claim "where .com meets .org". edubletooth captured a bunch of landings at the airports with the world's most famous approach: Princess Juliana in the Netherlands Antilles. Make sure to bend when a 777-200 or maybe even a mighty 747 is passing just meters over your head! This excellent video proves that Howto Oscar (we already mentioned him last month) does more than creating howtos. Together with Don's extremely detailed simulation of Gatwick Airport (EGKK), Oscar's video angles make this an interesting and pleasant video to watch. Watch the FlightGear PlayList for a collection of all (somewhat) quality FlightGear videos ever uploaded to YouTube. How about having your own Copilot to help you fly your heavy metal? Imagine: You're at 3000 ft making a hand controlled descent to EGKK 26L in your 777-200ER: "flaps down"; check airspeed and altitude; you're now five miles out; "undercarriage down"; reduce speed a little more; "flaps down"; you seem to be slightly overspeed; "spoilers"; touch down "brakes" then "reverse thrust"; "flaps retract"; now take a look at the detailed scenery while taxiing to your stand; "view" and "zoom out". Those using Windows can employ Shoot - a free user-editable voice command utility. This may be used concurrently with FlightGear to recognize spoken words or phrases and carry out keyboard actions - including sequential or Shift/Alt/Ctrl... keying. Unfortunately Linux users do not have access to such a powerful utility. Download Shoot 1.6.4 and install it on your PC. You also need the Microsoft Speech API (SAPI) which is also free; the link is given on the Shoot website. The free Microsoft .NET should also be installed using the Shoot link. Shoot may be edited to obey verbal commands such as "start engines", "maximum thrust", "undercarriage up", "flaps retract", "trim nose down", "deploy spoilers", "reverse thrust", "view exterior" - or whatever you choose. Try it and add more immersion to your flying. ...that in version 2.0, fellow pilots' chat messages could be ignored on multiplayer by checking the ignore box in the pilot list? For upcoming releases, pilots' aircraft will also be able to be ignored. This is part of a strong offensive against "trolling" that disrupts MP flying. ...that the USS Nimitz aircraft carrier has deck elevators that can be lowered/raised to go below deck? Toggle them up/down in your ATC Options menu under Carrier; Check-Apply raises them, unchecked-apply lowers them. This page was last modified on 11 May 2011, at 11:52.